Just as a little extra feature, Tonteknik Recording can now offer a low key version of a simple stay for visitors. We have a room on top of the control room, a little bit like a night liner bus with 5 bunk beds, each with individual sound proofing (to kill the artifacts of snoring). 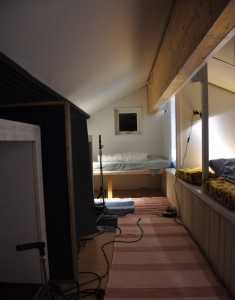 The bedroom also serves as home for the isolation booths so, you get to sleep with your amps. For many, a dream come true.